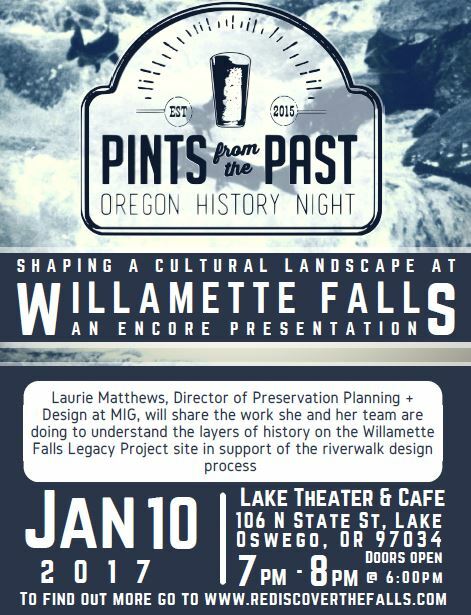 Due to overwhelming interest in the Pints from the Past community event featuring the Willamette Falls Legacy Project's cultural landscape report, an encore will be held on January 10, 2017 at Lake Theater & Cafe in Lake Oswego. Laurie Mathews, Director of Preservation Planning and Design at MIG, will be giving an encore presentation on her work to create a cultural landscape report for the Willamette Falls Legacy Project will inform the riverwalk design process. Pints from the Past is a discussion series and ongoing collaboration between the Clackamas County Historical Society, Oregon City Public Library, and Lake Oswego Public Library.